It's been two-hat weather here...I have to pull on one wool cap over the other. It's only been about 14 degrees or so (that's –10 if you live in Celsius-land), but it's also been windy. It's the wind that gets you. A week or so ago we had some rain and snowmelt, and there was a constant roaring coming from over by the creek. Now, after a handful of days sub-freezing temperatures, suddenly the creek is quiet. The waterfall's frozen. There's still water running, but it's mostly underneath thick encrustations of ice. Sound insulation! These pictures were taken with my new-to-me used Fujifilm XF 18–55mm lens, by the way. Both pics started out soft, but reducing them to blog size hides that fact. And I'm not sure yet why they were soft. I'm not sure I got a good copy of the lens; but downloading the latest lens firmware helped a lot more than I imagined it would. It's a very sharp lens when everything goes right, but it's going to be a while before I know it well enough to trust it. There's so much to test with these dang zooms! And so much more that can be going wrong. I always worry about buying used lenses. It's too easy for me to imagine that I got a lens that some other photographer tested and found to be a bad sample. Off to the backyard to fling the ball for the white dog, and Brrrrr. Scott DeMello: "I also shoot with Fuji. Over the past year I have slowly converted to shooting mostly with primes, but I do have the 10–24mm, 18–55mm and the 55–200mm. My memory is that with the 18–55mm you should not have the IS on all the time. I remember that this was my first Fuji Lens after I switched from Canon. With my Canon IS lenses, unless I was mounted on a tripod, I could leave the IS on. With the Fuji 18–55mm though, I found you should only have it on in situations when it is needed, otherwise my images were soft." Mike replies: Thanks Scott. Carl found that some of the early Pentax DSLRs that had SR were that way too. "Oh, and a note on presbyopia—in our mid-forties my wife and I founded a Lilliputian publishing house named Byopia Press. (Our optometrist was among the few people who got the joke.)" That top sunset image reminds me of the mid-stage of one of Bob Ross's "Joy of Painting" shows. Next he would begin plopping silhouettes of conifers on the lower left. It's too pretty...but it's real. Old people...Just like getting more nearsighted. Actually, with age, our eyes don't become nearsighted, they just have an ever-lengthening close-focus limit. The correct term is presbyopia. While not the same, it's more like farsightedness (hyperopia) than nearsightedness (myopia). In farsightedness, one can't focus on close objects, but those 'beyond infinity' are in range. People tend to get more farsighted (presbyopic) with age. "I'm fascinated by aging. It's really interesting, and I'm enjoying observing the effects." When you reach your 70s I don't think you'll actually enjoy the effects. NPR did a recent piece on the benefits of extreme cold. I'm a bit skeptical but don't plan to test these theories for myself. My vision has gone from near to far-sighted steadily since I turned sixty. I know it's time for a new formula when I can follow a golf ball better with my glasses off. Age and a lot of sun has left me with worsening cataracts that will need new lenses in both eyes. I am thinking of asking for one macro and one zoom. Bearing in mind that the 18-55 is the kit lens, it might be more prone to variability than some. I have one that is sharp but a friend bought one which was much softer and he had to return it after comparing it with mine. Keep an eye on it. It should be very sharp except for the 55 end which is a little softer. My XF 18-55mm gives really nice images but they are soft compared to the wonderfully sharp XF primes. "Soft" is perhaps a bit strong: images are just not as sharp as those made with the primes. However, I find that a slight modification to my sharpening technique in ACR gives me what I want. Strangely, I've not noticed the same lack of sharpness in the XF 55-200mm or XF 18-135mm zoom lenses. I discovered something about extreme weather last year that I'd never noticed before. Sometimes I'm out and about with my camera in very hot or very cold weather (both of which I dislike tremendously; extreme cold and wind is painful, but extreme heat and humidity is just plain loathsome). And I'll find my attention grabbed by a good photo subject, and so I drop into that sweet zone where everything goes away but my eye and that subject, and I work the picture: bracket exposures, reframe and rethink, try some different DOFs, exhaust the possibilities. I work it. And then I snap out of that state, and I discover that I had completely forgotten the extreme temperature. I suddenly remember that I'm actually freezing or dripping sweat. But for those few minutes, it had all just gone away. What a wonderful feeling. Another thought: we may lose 15 degrees of tolerance for the cold as we age, but I've gained probably 25 degrees of tolerance for the cold as I aged by getting much smarter about how to dress for it, and by being able to afford good cold weather gear. A couple hours today along the East River in the 18 degree air barely fazed me. Though I am going to adopt your two-hat technique, Mike. I can anecdotally agree with your assessment on age and weather. However, much as I hate to inform you, it does not appear to work with dogs. My two dogs are approximately 8 and 9 (I found them at separate times dumped on state parks). It was 24 all weekend here where I live in Texas and they had zero desire to go home where it was warm.... We spent a day hiking in the Sam Houston National Forest on Saturday. I think we may have hit 30 degrees if I was standing in the sun. They stalled and stalled the whole way back to the car. When we finally got there you would think getting in the car and going to home was the dog equivalent of a death sentence. I had the 18-55 until I gave it along with my XT1 to my niece. I'm more of 28-35-50 X Pro/X100 photographer. I never had any problems with mine. I thought it was a really first rate lens and far better than most "kit zooms." Butters is very lucky because he has snow. What my dogs wouldn't give for a day in the snow! I think I'd prefer your cold windy weather Mike! At least you can wear two hats and warm clothes. Spare a thought for the people in north western New South Wales, where temperatures are forecast to be 90F overnight and 116F daytime this Friday, which is Friday 13th. Nothing you can do about it outdoors. I remember driving in conditions not quite that hot in an un-airconditioned car many years ago. Stopped at every town to jump fully clothed into their municipal swimming pool, then back on the road with car windows open. Temporary relief for the very short time it took for the clothes to dry out. After that I never bought a car without aircon. Good luck with your lens. I mostly use manual focus primes now after an $800 repair to an autofocus Canon L lens several years ago. At least manual focus lenses have the potential to last several lifetimes if well stored and maintained. I intend coming back as a better photographer. "By the way, did you know that you lose about 15 degrees of temperature tolerance over an average lifespan? Old people really do get cold more easily, because our metabolisms lose adaptability, or responsiveness, and can't adjust as easily." Well, I'm past 70 and still enjoy the winter months hiking and photographing in the Sierras here in California, and don't feel that I get cold any more easily than I did 20 years ago. 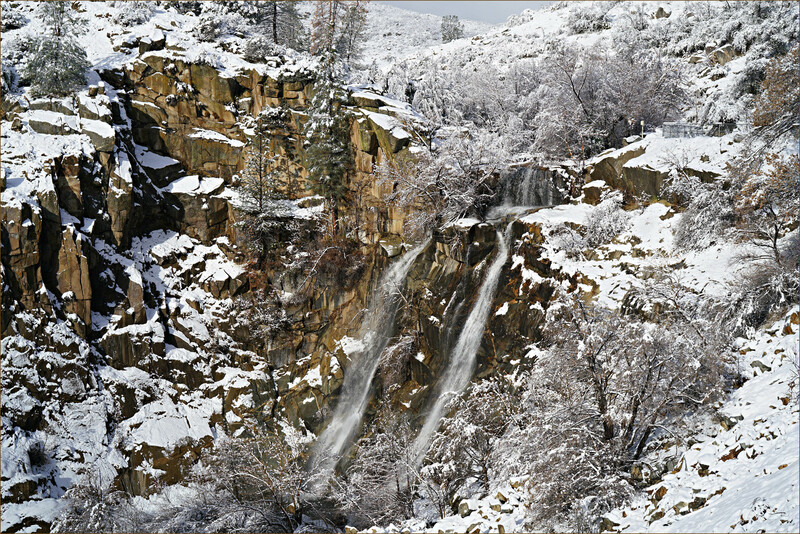 From my Christmas holidays in the Sequoia National Forest: South Creek Falls. Ah, the weather! I'm glad I live on the western seaboard of a continent. Despite my home being just over 10º of latitude north of where you are, I've never seen temperatures of -10ºC. A really cold night in Sheffield is anything below -2ºC, perhaps, and that happens only a few times a year. I think -7ºC was the worst I ever saw, and that was just for one night. Last night was +3ºC when we retired, and +5.5ºC when I got up this morning. Eyesight: yes, I suffer from presbyopia, and have worn reading glasses for about 20 years. It makes handling a camera difficult - I don't wear the glasses when actually looking through the VF, but trying to change any settings probably requires that I have them on. So it's "set and pray" most of the time. I wish I could remember who said "the second worst thing that can happen to you is getting old" but I'm not remembering that sort of thing so well. Google is no help, maybe I said it? Lovely sunset snap/grab/shot/pic/image/exposure/photograph/etc., Mike. Sunsets (via Galen Rowell) is what got me to love photography decades ago. I bought the 18-55mm zoom when I entered Fujiworld because I figured it would come in handy...and because with offers and rebates it was very cheap as part of the X-E2 kit, so why not? I've been very pleasantly surprised with it from the moment I took it out of the box and exclaimed out loud "how small is this thing!?". Until the 14mm came around it was my fast wideangle. Nowadays it's been relegated to do-it-all-when-I'm-out-with-the-family lens duty, and it fulfils this duty admirably. I've never found mine to be soft outside of stress areas (wide open at close focus distance), but then again, I don't tend to use it for pictures where I'm overly worried about extreme sharpness. One thing I've found has improved over the years with the firmware updates is focusing speed, so be sure to update it whenever it gets a new version. "Presbyopic"? A Presbyterian with failing eyesight? As for the two-hat cold, please mail some Down Under. We are sweltering through summer down here, as usual, and would absolutely love some cold, blizzardish weather. Which two hats, after the recent "Great Hat Search" ? I have the 18-55, which was included in the kit I purchased off of that auction site. I was nervous about the purchase, but it has worked out extremely well. Truth be told I haven't used the 18-55 much since I tend to use primes, both adapted manual focus lenses (Zuiko and Hexanon) and the Fuji 18/2. The latter is very good except for being a tad softer at the edges and exhibiting chromatic aberration nearer the edges. I have no idea how to deal with that, which is on a long list of skills I need to acquire. The Hexanon 28/3.5 is mounted on the X-Pro right now, but I think I will swap it out for the 18-55 and get reacquainted. The lens-based stabilization would benefit me. I remember being surprised by its performance when I first got it. Maybe we should plan an outing together. Temperature tolerance. Also get a check of thyroid functioning (a simple blood test). Intolerance of cold is a symptom of hypothyroidism. It is readily corrected with a daily hormone pill which costs cents (well, it does here; goodness knows what it costs in the USA). I also moved to the tropical islands north of Australia. Makes quite a difference. LOL. Re: IS use. Some of us using Olympus m43 cameras were having trouble with unsharpness a few years ago (apart from the ubiquitous shutter shock). We discovered that the trouble was the IBIS -- when we did everything right to hold the camera steady, the IBIS introduced unsteadiness! Hold the camera out and use the LCD for viewing and voila, sharp images! Obviously the IS was good for grosser movements, not the fine movements when the camera was mashing into the face with an eye level viewfinder. I think I detected the same with the OIS of the Panasonic 45-200 on the G1. Note that both manufacturers recommended turning the IS off when using a tripod. I made it a practice to turn the IS off for all work unless otherwise indicated, e.g. with slow shutter speeds and whatnot. It seems not to be a problem with more recent gear. Interesting that you, of all people, bought a zoom ! As a long term prime enthusiast myself, I've also made the U-turn regarding zooms last year. I bought the same lens as you, second-hand. And I made the same observation: it can be sharp enough, but sometimes it is not as sharp as it can be. I've not been able in the two months I've owned it to find rhyme or reason to that, but thanks to Scott and others for pointing out the IS. It makes sense, given that it can happen at 1/250 and f/8, where speed and dof otherwise dictate I should be ok. I've tested some other lenses for that very effect previously, and never encountered a practical problem with leaving IS on at all time, so this is new for me. Now to remember to turn it on and off... Bummer !